In a third article to follow, I will review the overall methodology of these studies and the implications for the viability of the station proposals. Updated March 21, 2017 at 6:51 pm: The Metrolinx study of stations at the Don River on the Lake Shore corridor does not include the effect of proposed employment at the Great Gulf “East Harbour” site. 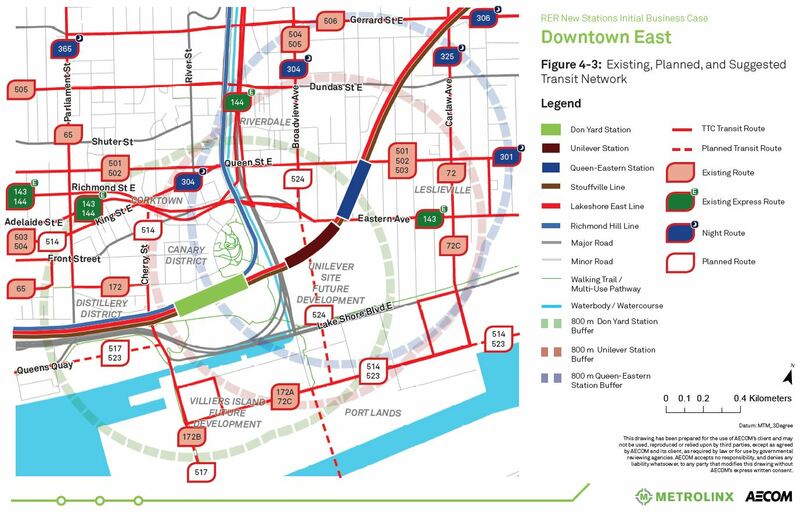 Therefore the ridership projections and comparative evaluations of stations are based on a situation where this major proposed node does not exist. I have added a relevant quotation from the study to illustrate this. The Lake Shore East corridor begins at Union Station and travels east along the southern edge of Toronto into Durham Region. There are existing stations at Danforth (Main), Scarborough Junction (St. Clair west of Midland), Eglinton, Guildwood and Rouge Hill. New stations are proposed at the Don River (aka Downtown East) and at Gerrard. Both of these are included in the SmartTrack station sites to be funded by the City of Toronto. The proposed new Don Station is the most complex of the studies because it is in the heart of the city where major redevelopment is expected over coming decades. It is also a point where several existing and proposed transportation services combine as the eastern entrance into downtown. The map below shows the location of three possible stations together with the surface transit network as it is and might become. Almost all of the land around and south of the rail corridor south of Eastern Avenue and Front Street will be transformed with new residential and commercial buildings. Rapid transit, whether it be GO Transit or the Relief subway line, will play a major role in getting people to and from this district, especially to jobs, but the surface network will be essential to provide the fine-grained access over a wide area. One rapid transit node cannot serve the entire district. A fourth site, at Parliament, was rejected because it would be difficult to build and could compromise operations in the rail corridor. This was a site once touted as a possible SmartTrack location that might have eliminated the need for an eastern waterfront LRT, although that was more spin and wishful thinking than hard analysis. This station would fit, just barely, between Queen Street and Eastern Avenue and would be accessed from either end. In serving future development, this is the worst of the options as it is the furthest from any new buildings. Although on a map, the station provides an intercept for traffic bound to the core on the Queen streetcar services, it would be an unattractive change because of the extra transfer time required compared to the roughly 10 minute ride simply by staying on a streetcar. There is a basic problem for connections near the core – the transfer imposes a penalty that wipes out the higher speed possible on the rail corridor, and riders would be attempting to board trains that are already full from stops further out. 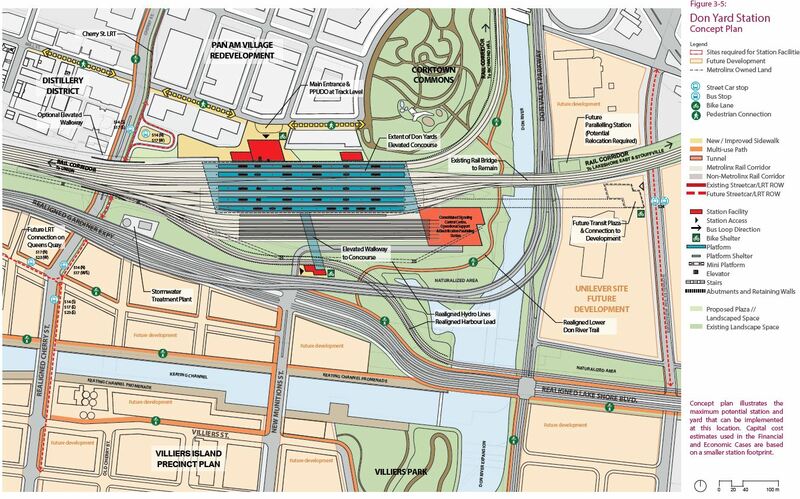 With the City’s decision to take the Relief Line south through a planned East Harbour Station, the Queen/Eastern site would not be part of a unified hub. It is the least attractive of the three proposals. The estimated capital cost for this site is $143.2 million (2015). In the map below, north is to the right. A station at East Harbour would serve GO Transit, a future subway Relief Line and a proposed extension of the Broadview Avenue streetcar service connecting into the eastern waterfront LRT network at Commissioners Street. [T]he station presents significant issues related to curvature, grade, and superelevation of the track at the platform level that would be operationally challenging and would require mitigation to avoid impacts on passenger safety, passenger comfort, and operator sightlines. The gap between the train and platform may be wider than typical due to the curvature and the superelevation, especially for trains on the west side of a platform, which would be tilting away from the platform when stopped. Trains stopping on the west side of a platform would also require extra equipment for viewing the length of the platform from the train. The estimated capital cost for this site is $118.9 million (2015). The Don Yard station design is intended to serve not just the Lake Shore East corridor but all trains arriving from the east including those from Richmond Hill. This makes the station substantially larger than other proposals and much more expensive. The location would better serve the lands west of the Don River which are or will be primarily residential, but it would not be in the heart of the East Harbour development nor connect directly with a future Relief Line station. This station was designed not simply for the GO “additional stations” project, but as a significant alternative to Union Station for capacity relief there. A new station that would serve all trains east of Union poses geometric challenges for tracks on the approach notably from the east where a mixture of trains from the Stouffville and Lake Shore corridors, some running on express tracks, would all require access to platforms at the Don station. The estimated capital cost for this site is $247.7 million (2015). The ridership projections for the three sites are counter-intuitive in that the Unilever option produces the fewest new riders. The reasons for this are not explored in the report. Some of the discussion of walk-in access belies as typical GO Transit mindset in which lengthy walks are considered “normal”. For example, each option is compared for access from Regent Park which lies some distance to the north and is already served by east-west streetcar routes with a short trip to the core. Why anyone would walk all the way to the rail corridor south of Front/Eastern and east away from downtown is a complete mystery. That this is even considered suggests that the demand model casts its net far too widely for an urban station. Queen-Eastern station is estimated to have 58 boardings in the AM peak period and 166 boardings daily in 2013. There is estimated to be 1,222 alightings in the AM peak period and 3,496 alightings daily in 2013. In 2031, it is expected that Queen-Eastern would have increased to 6,878 trips daily, which includes gross boardings and alightings. After subtracting the approximately 2% of upstream riders that would be lost due to the additional travel time to serve the new station, there would be a net gain of 1,984 net new riders daily on the GO system in 2013 and 3,728 net new riders daily in 2031. Unilever station is estimated to have 46 boardings in the AM peak period and 131 boardings daily in 2013. There is estimated to be 974 alightings in the AM peak period and 2,784 alightings daily in 2013. In 2031, it is expected that Unilever would have increased to 5,478 trips daily which includes gross boardings and alightings After subtracting the approximately 2% of upstream riders that would be lost due to the additional travel time to serve the new station, there would be a net gain of 1,252 new riders daily on the GO system in 2013 and 2,352 net new riders daily in 2031. A truly bizarre piece of analysis plays down the attractiveness of a “TTC fare”, an integral part of the SmartTrack scheme, for this station. The following text for the Univeler option is similar to that for the other two. In other words, giving people cheaper fares on GO would encourage ridership from stations further away from downtown, but these riders might be dissuaded from using the service because of the extra stopping time at a new station or stations on the line. The study concludes that the Queen/Eastern option is the best of the three overall, but this depends on a number of factors including the high cost of the Don Yard option and resolution of track geometry problems for the Queen/Eastern option. The Unilever option is the lowest ranked, but given its active promotion by Great Gulf, is likely the one to receive political support. All three require additional study to verify factors such as the complexity of construction and the degree to which they will support development in the waterfront. Updated March 31, 2017: The ridership projections and relative rankings of the station sites do not include provision for the effect of development at East Harbour even though one of the options is located at that site. This explains its poor performance. Specifically, the study considers the option for development a “sensitivity” (i.e. something that should be tested for its effect), but the report does not incorporate such a test in its recommendations beyond saying that East Harbour development would benefit station sites east of the river more than the Don Yard option to the west. The First Gulf Unilever redevelopment proposal was considered as a sensitivity, pending adoption of required land use changes and commitment to requisite infrastructure. Development of the Unilever site provides the potential for increased ridership, and thus improved financial and economic feasibility, for all three station options. Assuming the development of 23,000 jobs by 2031 and no further growth beyond that (approximately half of the developer’s intended 50,000 jobs), Queen-Eastern and Unilever could attract close to 10,800 additional riders daily and Don Yard could attract close to 9,400 additional riders. However, it is unclear whether the additional employment would be sufficient to take the stations to financial and economic breakeven. Part of the reason for this is that the additional employment may abstract from employment, and hence ridership, elsewhere in the GTHA. Further analysis is thus required to fully capture the impact of this additional ridership on fare revenues, total costs and economic benefits. Further analysis should also be undertaken to determine the overall financial and economic impacts of other development proposals in the area on the three station options. The Gerrard/Dundas station would lie between Carlaw Avenue (where the rail corridor crosses Gerrard Street) and Logan Avenue at Dundas. A considerable amount of the demand projected for this station depends on redevelopment of commercial property around the corridor between Carlaw and Pape, as well as transit feeder services using bus routes extended south from their current terminus at Pape Station. This is the same location as a possible future Relief Line subway stop, and it is obvious that any construction here should take this into account up to the point of prebuilding any structures the RL might require to avoid future disruption. A good argument could be made that stopping both routes here would be overkill for a comparatively minor development location, especially in light of the plan to have a joint station only a short distance further southwest at the Don River. A site between Logan and Dundas is not well sited compared to the Gerrard option for future development and connections to transit routes, and it is too close to the Unilever site. A site further east, straddling Pape Avenue, would be constrained by existing and planned buildings, and this would interfere with the need to widen the corridor. Gerrard/Dundas would be an expensive station and its presence in the City’s list for SmartTrack may be as much a political decision as one that reflects good network planning. This station faces the same competing forces for attracting and discouraging riders as the set of proposals for a station at the Don River (see above). Riders would be atttracted to the line for a faster trip downtown, especially if they were bound for the immediate vicinity of Union Station, but the extra stop would discourage some riders from further east. The two effects would not balance, and a net loss of riding is projected. 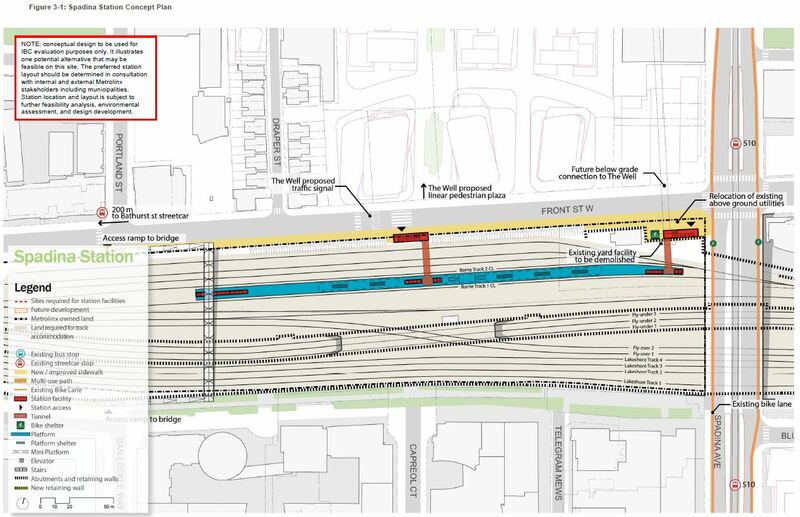 This site also would be affected by the proposed addition of a fifth track to serve express trains further west, and this could add to property requirements for a Gerrard Station. The proposed bus loop consumes a substantial chunk of land that could be put to better use. It would serve the Don Mills local and “rocket” services, the Thorncliffe Park bus and the Pape bus. This function would be superseded should a Relief Line be built in the Pape-Thorncliffe-Don Mills corridor. One negative factor cited for a Gerrard/Dundas station is a long 120m pedestrian tunnel between the GO station and an Relief Line station under Pape. 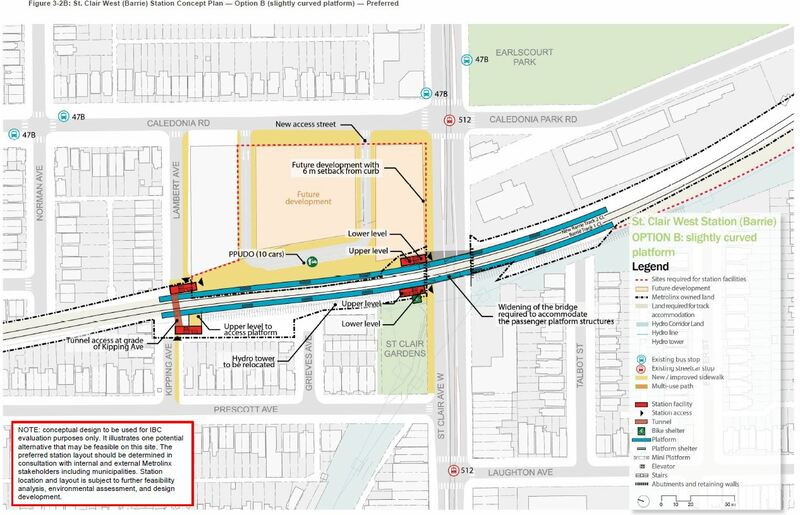 However, there is now an option under study that would see the RL dodge west from Pape to Carlaw, and this would provide a substantially better link to any GO station between Carlaw/Gerrard and Logan/Dundas. The table below shows the projected ridership, but this depends both on the existence of a significant residential and commercial node, and the assumption that this is the only major rapid transit link to this area. The economic case for the station depends on the new riders. Even though there are some lost trips “upstream”, the station is projected to attract many riders as a destination in its own right. This would offset the vehicle kilometres lost from upstream riders who now use the line. By contrast, several other stations (notably along the Stouffville and Kitchener corridors) are primarily origin points for trips to the core and do not generate any traffic in their own right as destinations. The estimated capital cost for this site is $251.7 million (2015). The Barrie corridor splits off from the wider Weston corridor at Dundas Street and heads straight north parallel to Caledonia Road. The only existing station within Toronto is called “York University” although it is actually in an industrial district east of the university. Metrolinx proposes to shift their stopping location south to the new Downsview Park Station on the extended subway when this opens in late 2017, but there is some opposition from York about having to transfer to the subway to reach the campus. That issue is not yet resolved. 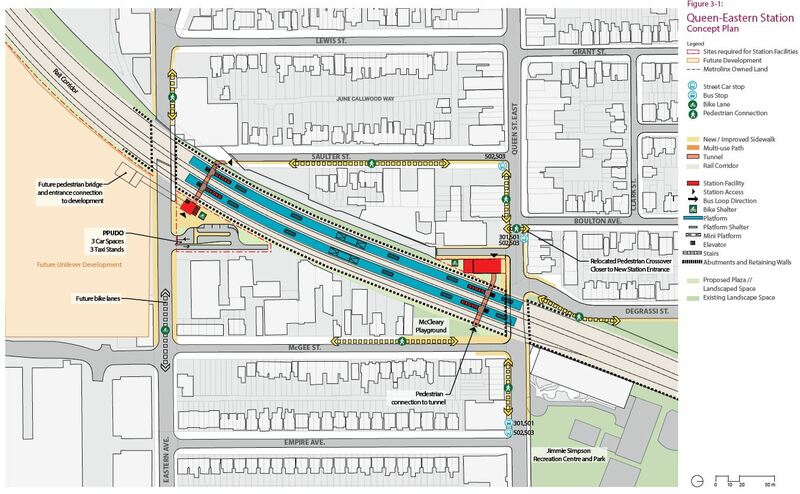 A new station is planned at Eglinton connecting with the Caledonia Crosstown LRT station that would open in 2021. Two stations further south are to be partly funded by the City of Toronto in payment of an outstanding $60 million claim by Metrolinx for the City’s contribution to the GO Transit Growth fund – Spadina and Bloor/Davenport stations. A possible station at St. Clair was studied, but it is not included in GO’s expansion plans. The original proposal was for a “Union West” terminal station where trains from one or more of the northwest corridors would end, thereby reducing the demand at Union Station. A rapid transit connection, possibly the western end of the Relief Line, could provide distribution into the core much as the Yonge-University subway does at Union. The current proposal is for a line station used only by the Barrie corridor service. Trains would continue east into Union Station. The area near this station will see substantial residential and commercial development, notably on the former Globe & Mail site immediately to the north, and the station would be a convenient alternative destination for many riders bound for the west side of downtown. The Barrie corridor running on the CN Newmarket subdivision. This splits off at Dundas Street. The Kitchener corridor running on the CN Weston subdivision. This corridor also hosts the Union Pearson Express trains which branch off from the south side of the Weston corridor at Pearson Airport. The Milton corridor branches off at West Toronto Junction to run via the CP tracks into central Mississauga. The geometry of these corridors and of Union Station places various constraints on train movements, and in particular will require reorganization of platform usage at Union once these lines are all running frequent service to avoid conflicting movements. Today, the UPX uses the northernmost track at Union as a “premier” connection to the station with its own dedicated waiting room. However, the airport is on the south side of the rail corridor, and all UPX trains must traverse the corridor creating conflicting moves with through trains on the Kitchener line and with Barrie trains at Union Station. Richmond Hill trains split off at the Don River via the CN Bala subdivision. Stouffville/Lincolnville trains split off at Scarborough Junction via the CN Uxbridge subdivision. Lake Shore East trains continue straight through. Spadina station for the Barrie trains is possible because they join the corridor at its northern side. It would also be possible to stop trains from the Kitchener corridor here if the station were larger, but with the planned Liberty Village station only a short distance to the west, this will not happen. The result is that Barrie trains will not serve Liberty Village, and trains on the Kitchener line will not serve Spadina. At least some of the service from the Barrie and Kitchener corridors will be through-routed at Union providing access to whatever station is built to serve development at East Harbour (Don River). Projected ridership and revenue for Spadina Station are quite strong because it will be a significant destination in the network. Ridership forecasts for Spadina indicate it could attract an estimated 4,350 passenger trips in the AM peak period in the 2031 scenario (approximately 12,400 new trips daily). The station would serve primarily as a destination (rather than an origin station), with approximately 96% of new riders alighting at the station. Further, an estimated 1,950 existing AM peak period passengers (5,550 daily) would alight at this station. It is assumed that these riders would be destined to downtown locations west of the station area, and would otherwise be destined to Union Station. Introduction of Spadina is therefore expected to provide some relief to congestion and crowding at Union Station. Even with a projected loss of riders due to the extra stopping time, this will be more than offset by new trips attracted by this station. This must be tempered by a recognition that this station will have a longer dwell time than at most new sites in the network because of the heavy demand. Instead of a 1.8 minute delay, Metrolinx projects a 4 minute delay, and this could actually be longer when constraints on the track layout west of Union is taken into account. One option under consideration is that some Barrie trains would run express to Union bypassing Spadina. This could reduce ridership losses due to the extra delay, but would also reduce the attractiveness of service at the new Spadina station. The station poses a staging problem because its site is currently used for off-peak train storage. Provided that off-peak service ramps up before station construction begins, GO Transit operations might not be affected by the loss of three tracks here. The capital cost of Spadina Station is $25.1 million (2015). The proposal for a station near Bloor and Lansdowne arises from the long controversy over the Davenport grade separation project on the Barrie corridor. There was a tradeoff between the intrusion of the new bridge and the provision of a station on the GO line. … a GO station at Bloor-Davenport is identified within the City of Toronto’s Official Plan and enjoys strong political and community support. It could help to integrate the GO RER and TTC networks through a potential future connection to the TTC’s Lansdowne subway station, and assist in alleviating pressure on crowded TTC bus routes, particularly for riders with downtown destinations. The station could support access to a growing mix of residential, commercial, and employment uses along the rail corridor, and in particular could improve access to businesses in the Sterling Road and Junction Triangle Communities. The new station’s platform lies entirely south of Bloor Street so that the grade up to the bridge at Davenport can begin immediately north of Bloor. This station would provide a transfer point for Bloor-Danforth subway riders to the Barrie line either for access south to Union Station or north to destinations beyond Steeles Avenue. Riders bound to or from York University are far more likely to use the subway for their entire journey as this would take them directly to a station in the university campus. 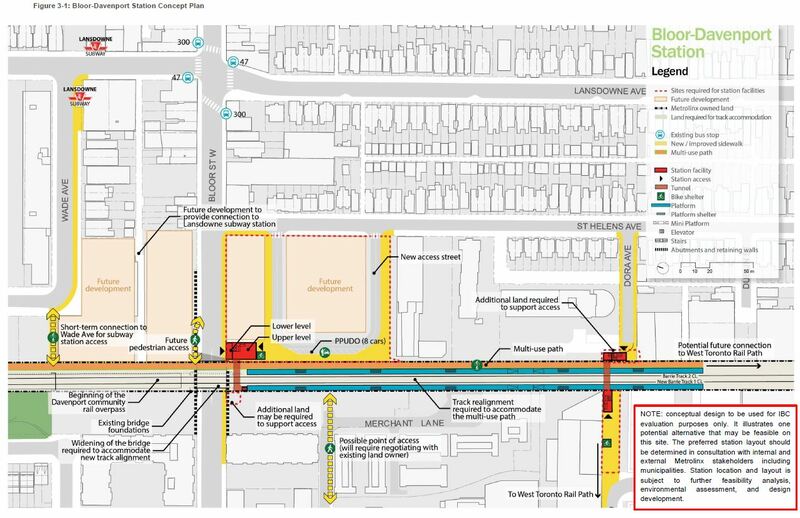 A walking connection to Lansdowne Station on the Bloor-Danforth subway would be possible via Wade Avenue, although it would not be weather protected. Future development of lands northeast of the station would be an opportunity to improve this link. Lansdowne Station’s structure ends just west of the entrance shown on the map below and there is no opportunity to break into an existing structure here as there is between Bloor Station on the Weston corridor and Dundas West subway station. 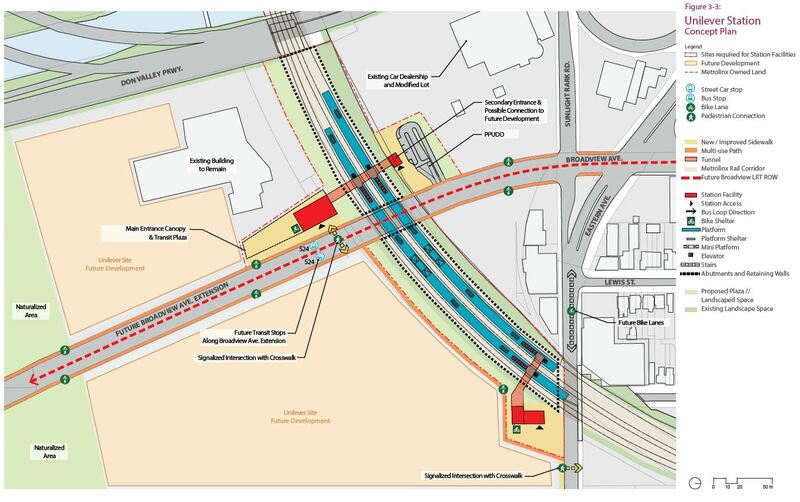 This is a simple station to build, with a capital cost of $32.3 million (2015), particularly if work is co-ordinated with double-tracking the Newmarket Subdivision and construction of the Davenport grade separation. However, it is projected to have a very negative net value due to the effect of the extra stop here on Barrie corridor ridership where more riders are lost “upstream” than are gained by the new station’s existence locally and as a subway transfer point. In the map below, north is at the left. Metrolinx studied a possible station at St. Clair on the Barrie line. Located at the former CN/VIA St. Clair Station site half way between future stations at Eglinton/Caledonia and Bloor/Lansdowne, the area has limited potential for development containing low rise residential, parkland and Prospect Cemetery. There are connecting TTC services, but these do not offer substantial added passengers for GO, and any attraction would depend on a “TTC” fare for service even though this station is not on the “SmartTrack” corridor (Stouffville/Union/Weston). Two options for this station were considered. Option A locates the station north of St. Clair and avoids issues with both the curve and grade change to the south. However, it raises problems with adjacent structures. Option B shown below straddles St. Clair and is preferred. However, this station is not included in the GO/RER expansion program. The estimated capital cost of this station is $31.1 million (2015). In the map below, north is to the left. The Lake Shore West corridor extends from Union Station parallel to the south edge of Toronto with existing stations at Exhibition (south of Liberty Village), Mimico (Royal York) and Long Branch. 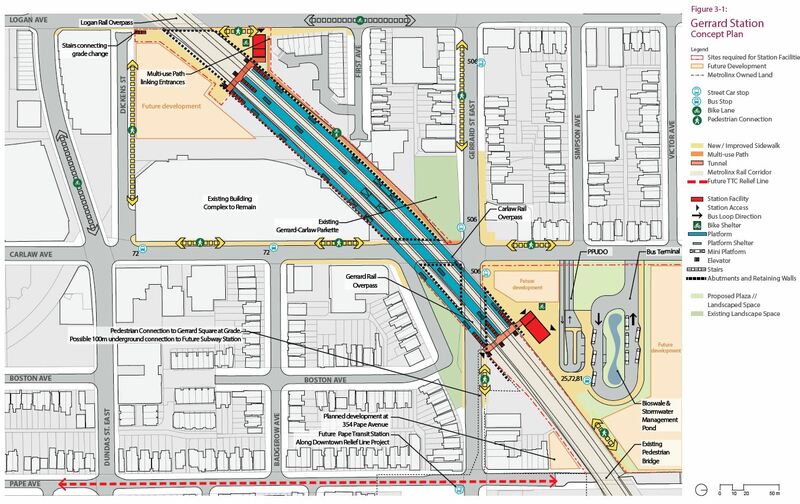 No additional station is planned for this corridor, but there is a debate over the possible relocation of the Mimico station to serve new developments further east in Etobicoke. The choice of station locations is between two closely-spaced sites. Mimico was originally a CN station and it lies at the east end of the main yard for VIA and GO equipment maintenance and storage. Park Lawn, 1.3 kilometres to the east, is at the centre of a relatively new and growing cluster of high rise residential buildings. Either way, these stations are overwhelmingly trip originators, not a destination in their own right. Mimico’s primary function today is to provide an alternate route to the core area for residents of southern Etobicoke who can reach the station easily. Most users of the station drive (or are driven) to it, and there are 330 parking spaces and more on the way. Over the past two years, daily weekday boardings and alightings at Mimico station ranged from 2,578 and 2,961. Based on Statistics Canada 2011 Census data and the 2013 GO Rail Passenger Survey, it appears that less than 4.0% of the estimated 9,300 people residing within 800 m of Mimico station are regular GO customers. With 330 commuter parking spaces and proximity to a number of key destinations (e.g. schools, recreation facilities, Business Improvement Areas), the Mimico station does draw from a large catchment area. In other words, Mimico Station depends less on its specific location than on the availability of parking for its demand. Advocates for a Park Lawn station point to the high population density as a draw. Because of their close spacing, only one location will survive as a GO stop, and the debate pits existing riders against potential future users from the new condos. There would be little or no parking at Park Lawn. The potential station is within proximity to a number of local transit lines. A related issue here is the Waterfront West LRT study which is part of the overall “Waterfront Reset” now underway. An alternate service that could link the condos at Humber Bay to downtown would be an LRT originating at a proposed loop at Lake Shore and Park Lawn (or possibly further west), running east via the existing Queensway right-of-way and then dodging south through parkland to reach the Exhibition streetcar loop. Various routes and implementations have been proposed, but the study has not yet settled on a preferred option. An LRT service would be about 400m south of the Park Lawn station site and would more central to the cluster of existing and planned condos (Christie’s Bakery site). “LRT” service from Exhibition Loop eastward would be constrained by the speed and capacity of existing trackage now used by the 509 Harbourfront car, and especially at Union Station Loop. An alternative loop has been proposed, but evaluation of this is also part of the “Reset” planning. Implementation of a new Park Lawn Station could possibly occur before the LRT line, and this gives the advantage of immediacy. The condo area is not one where the extra cost of travelling by GO to the core would be an issue, and speed trumps cost. Although the report speaks of strong ridership at Park Lawn, the ridership projection is not as rosy. The table below shows a modest number of new riders, and shows no losses from “upstream” riders even though Park Lawn is less attractive for those who now park at Mimico. Moreover the additional revenue per rider, at roughly $1.30, does not make sense (I await a reply from Metrolinx explaining this). It is unclear whether this is the effect of discounting future revenue at a higher rate than assumed fare increases (in effect with future riders paying lower fares discounted to today’s dollars) or from revenue lost to those who abandon GO because they can no longer park-and-ride. The estimated capital cost is $189.4 million (2015), and this is a high cost site because extensive infrastructure changes would be needed to accommodate a Park Lawn station. The site is constrained at the southwest by Etobicoke Creek and at the northeast by the Gardiner Expressway. This entry was posted in Commuter Rail, SmartTrack, Transit. Bookmark the permalink. I find it hard to believe that a GO Bloor-Lansdowne station on the Barrie corridor would suppress upstream ridership unless the connection is a crappy one. And of course, that is exactly what is planned, because GO is unable to learn from history, it seems. With any of these stations, I say don’t bother unless we’re going to get the connections right. A weather-protected connection to Lansdowne – of course. More controversial is another connection to the GO/TTC/UPX interchange station a few hundred metres to the west at Dundas. But that would really make the Barrie line shine as a way to get to the airport, GO Kitchener and TTC Bloor. How can there possibly be a station between Queen and Eastern and another one at Logan? That’s less than 900m between them, entrance to entrance, walking down Logan and west on Queen. Even subway stations aren’t planned that close together anymore? And West Union made so much _sense_. I guess that’s a good enough reason all by itself not to do it, right? I don’t understand how the East Harbour site generates so little traffic. When completed it is suppose to employ 50,000 people and it will be linked to the lower Donlands with a new streetcar line. It will be served by the new Relief line. Is it not closer to any new development on the eastern end of King then Union station is? Maybe the King car should loop through this site and not the Broadview station. Steve: The problem appears to be that the demand projections were done without including much of the employment that the Unilever site would generate. development proposals in the area on the three station options. This begs the obvious question of how one can claim to “study” and “recommend” station sites. The caveat about East Harbour being a “sensitivity” (i.e. a potential change that might produce an alternate outcome) is not reflected in the recommendations. Instead, the report plumps for Metrolinx own preferred location west of the river even though a major hub at East Harbour is a significant part of the Great Gulf proposal. I will update the article to note this issue. If they have identical levels of service can the Kitchener and Stouffville lines be amalgamated? Could they both run through Union, just as the Lakeshore East and West lines do? If so, then that means that there would be through service from the north-east, east, west, and north-west corners of the GTA. Won’t some of those 50,000 workers be drawn from all across the GTA? If so, how else will they get there if not on the GO? And, compared to Union station, wouldn’t this be an easier transfer for travellers wanting to switch from one of those lines to another? Steve: Yes, there are plans to through-route these services, although it is unclear whether this is part of the demand model for all stations. How slow would trains have to travel through the station area to simplify the platform construction? Maybe the tradeoff is worth it. Steve: That’s an “it depends” answer. Frankly I think that the Don River station, whatever it is called, is an obvious place where express trains would stop too, not just locals. However, with all the confusion about what is a GO stop and what is a SmartTrack stop, this may not happen. Thanks for everything you do on the transit file. Even with your help, I remain baffled most of the time. Ross Trusler said: More controversial is another connection to the GO/TTC/UPX interchange station a few hundred metres to the west at Dundas. Metrolinx built to the property line and even included a wall with knock-out panels. There has been a design kicking around since the 80s (and possibly others before that), the main issue is that the connection would cut through The Crossways building. Last that I heard, they were trying to sell it or it sold, and basically the City/Metrolinx needed to wait and start negotiations over again. Basically, the solution is ready if anyone can put together the three parts of political will, funding, and land aquisition. David Weil said: How can there possibly be a station between Queen and Eastern and another one at Logan? Really, they won’t. It’s one of the major problems with these stand-alone station analyses. Basically, they’ve taken Pape and moved it east because it’s cheaper/better between the two and Don/Unilever and moved it west because it’s cheaper/better, but the combination is not the best. I’m hoping we’ll eventually get to a line analysis that will rationalize the system needs. Even better would be some coordination between the various projects in the area (Cherry St LRT extension, East Bayfront LRT, DRL, etc.) so that a ‘mobility hub’ can integrate the residential and commercial developments separated by the river and highway. Assuming some kind of fare integration that facilitates transfers between GO and TTC, I believe that this station will be very attractive to people who commute to York University from the West End (of which there are many). They could still arrive in the middle of campus if they transfer to the subway at the new Downsview Park station. Moreover, this would likely be faster and more comfortable than transferring at St. George during rush hour. This is an area where GO RER could take some pressure off the overcrowded transfer points on the TTC, by rerouting those commuters who don’t actually need to go downtown, but are currently forced to go there just to transfer. Steve: There are a few basic problems. First is that the Barrie line service will run every 15 minutes making an average wait 7.5 minutes plus the time needed to get off the subway, exit from Lansdowne Station and walk over to the GO station, probably out of doors. At Downsview Park, there is another transfer connection, albeit one that is better designed. The remaining difference in travel time may not be enough to encourage York-bound riders to make a three-hop journey when they could have only one connection, and a simple one at that except during peak periods. Then there is the question of just what the fare would look like, and Metrolinx has yet to enlighten the world on its “integrated” fare structure. To add to this: I don’t know York U.’s current lecture schedule, but universities schedule a lot of their lectures from 10 AM onward. Professors, many being night owls, don’t like to have to come in at 8 and 9 AM if they don’t have to, and neither do students. Transferring at St. George at 9:30 AM is not nearly as bad as doing it at 8:30 or 8:45 AM. If you’re doing it even later, it’s a breeze. As for those West End commuters to York U.: being from the West End, and having friends who have studied at York U., my impression was that for a lot of them taking a series of buses (northward, then eastward, or whichever combination, sometimes one transfer, sometimes two, depending where they were starting at) had up to now been more logical than using the subway, since going all the way by bus made more sense than taking a bus to the BD subway, then going to north to Downsview, and then taking another bus from there. However with the subway going straight to campus, this might make sense now for many people since the last leg by bus is cut out and it will probably end up being faster/more convenient. Finally, a huge problem which I see with anyone transferring between subway and Smart Track in order to unburden the TTC network is on the TTC side: subways, especially at rush hour, have the nasty tendency to experience rather significant delays. Buses doing “frequent service” during rush hours are usually plentiful, but also not reliable in terms of schedule. If you’re a commuter, this is very annoying, but easily rectifiable: if you know 10-15-20 minute delays over your trip are common, leave that much earlier for work or wherever. You might end up getting there early every other day, that’s all. If you miss a bus, the next one is there in a couple of minutes; if you’ve been delayed in the subway, you know in any case that your subway connection at BY or SG is always 2-3 minutes away. With Smart Track service running every 15 minutes, if you get delayed in the subway by 5 minutes, you’ve missed your train, and must now wait for the next one. This means you might need to add a huge amount of “padding time” to your trip, maybe as much as 30 minutes, which will eat up the benefit of the faster ride. If ST ran every 5 minutes as originally envisioned, this would not be a problem. Just to expand on the last paragraph of my previous comment. I lived for a couple of years in Zurich. Zurich has a well-spread streetcar (LRT) system that is the backbone of its public transit network. Since Zurich is much smaller than Toronto, we can consider it analogous to the TTC subway+streetcar system in Toronto (some portions are underground or elevated, and most of the system has its own 24/7 ROW). Zurich also has a commuter rail system – the S-Bahn – which has a lot of stations within the city limits and can be used as a sort of “express subway”. We can consider it analogous to a potential ST + GO/RER in Toronto in the future. The fare is completely integrated and transparent, you pay the same, use the same passes etc. whether you go from A to B by streetcar/bus or train, or any combination thereof. 1) The trains ran maybe 12-15 minutes apart during the very peak, and outside of that it was 3 trains per hour (2 in the “dead” hours of the day). I was often travelling outside of peak (especially going back in the evening). Miss a train = wait 20-25 minutes. One could easily miss a train by 30 seconds, say. Pouring rain makes you slower walking, it snowed and it’s slippery and you only realize that once you get outside, etc. etc. 2) Due to crowding, I would miss my streetcar connection by a few seconds. The next would arrive in 6-7 minutes, or more (outside of peak), making it more sensible (or less annoying) to just walk that part of the route, in which case the time advantage disappears. 3) Train stations are simply larger than surface streetcar stops or subway stations, even peripheral ones with just 4-5 platforms. They need to be deeper underground, or higher up, or occupy more space around them if at ground level. Once you get to a streetcar stop, you are there. Once you get to a subway station, you are one or two flights of stairs away from the train. At a commuter train station, you might have to traverse several hallways, stairs, etc. – you just can’t count on this being traversed easily in 1-2 minutes every time, esp. during crowded periods. Result? To reliably achieve the ideal on-vehicle travel time with the train+streetcar of some 15 minutes, I had to “pad” my travel time with extra space, i.e. make sure I leave so that in the ideal case, I am at the platform 10-12 minutes early, which gives me enough time to be “late” and still not miss the train. Which meant my door-to-door time was maybe 5 minutes shorter than the full streetcar option, with a lot more annoying transfers and things to think about. One misstep or unforeseen thing, and your travel time doubles. With the streetcar, if I just missed one, my travel time increased from 40 to 46 minutes, since I just catch the next one. Not a big deal, predictable, easy to deal with. Obviously, I gave up on the idea of taking the train to work. What did I take the train to? Well, the suburbs clearly, when I needed to go there. Also, if I had to go really to the opposite end of town, which might take an hour and a half by streetcar/bus, and the train travel time is 15 minutes say, so even if I add 15 minutes to that to make sure I will catch my train, it’s still well worth it. Who took the train? a) Well, suburban commuters clearly, for whom the dense network of stations in the city allowed better access to the city itself (they didn’t all have to go to 2 or 3 central hubs and then distribute from there). b) People who lived on one end of town and worked on another. c) Finally, people who lived right next to a train station and worked right next to another one, and who could easily catch the train each time. For routes which were “parallel” and the distance not large (from some part of town to the city centre for example), people took the streetcar, even if the train could potentially save them a lot of time in the ideal case – because the streetcar was more convenient and more “robust”. I think all of this maps exactly to the TTC and some future GO/RER/ST. It’s easy for people to look at points at a map and say “you can transfer here and here and here and it’s great!” but in reality with such systems things are a bit more complicated, as access to commuter trains (even if they are EMUs in the best case) is not the same as access to “urban only” rapid (and nonrapid) transit. Steve: The experience you describe is one reason I have a big problem with “mobility hubs” which Metrolinx tends to imagine wherever two lines cross, whether they are really useful for real-world trips or not. Obviously Metrolinx is not considering or falsely expecting the long term benefits of the potential Park Lawn station. Logically, with the current pace of the development of new condos, the population increase will proliferate. Metrolinx is maybe assuming the increase in population as per historical record or at a straight line. The catch here is that once the Park Lawn station is built, although lots of current users may be lost (this is also an assumption), the community nearby (ie. Park Lawn region) can grow to a larger extent. Not to only consider current new buildings on site or in development to include in the scope, but there is a greater potential in terms of the community development. Also, would the current Mimico GO users all be lost? I doubt that as probably at least 1/3 or a half of the population there is already coming from the Park Lawn region. Additionally, there is a capacity to run a ‘Shuttle Bus’ if Metrolinx have not yet thought about the idea. This could well work as of now to the Mimico GO station as well for the potential Park Lawn station. Take away to Metrolinx: I would say do not underestimate the population increase in the Park Lawn region, this is not the period in which the data was gathered to calculate the population increase factor. We’re already at the future and there is more influx of potential population anticipated at even higher pace. You stated that SmartTrack will open before the Scarborough subway but I believe that you also implied that SmartTrack will also shut down the SRT which can’t happen until after the Scarborough subway opens. Or perhaps Lawrence GO/SmartTrack station will simply be added later by which time probably a GO/SmartTrack station at Ellesmere will also be needed. I would much rather that the SRT is upgraded after the Scarborough subway opens. Steve: The Lawrence East ST station cannot be built while the RT station remains. This means that either the SRT shuts down at the point where Lawrence East ST station construction begins, or that station will not be available until some time after the SSE opens and the RT is no longer in the way, say by 2028 if SSE opens in mid-to-late 2026. A related problem is that the double track for the Stouffville Line would have to be built in a temporary location east of the RT station (assuming it will fit), and then relocated to the west as part of the ST station construction. I’d like to note that First Gulf has a completely different vision for a Downtown East/Don/Unilever/Queen station than anything in the Metrolinx documents. They have an ambitious plan to have the station spanning the Don river. This plan would basically be something of a hybrid between the Unilever and Don Yard Metrolinx proposals. If I recollect correctly, First Gulf indicated that they’d made some headway with Metrolinx about this configuration – most notably about having stations on a curve. I’m curious as to whether Metrolinx will be evaluating such a configuration. Further, I’ll note that the city has now done it’s analysis of a jog from Pape over to Carlaw near Gerrard. The new alignment scores better on every evaluation criteria aside from cost. And without a funding envelope, it’s easy to spend “virtual dollars”. This alignment would put the Gerrard Square/Riverdale Relief Line station on the diagonal between curves in the jog, and place the southwest entrance in the same location as the northeast entrance to the proposed “Smart” Track station–improving the outlook for both proposals. Though I’m local to the area, I tend to agree that everything proposed is overbuilding for what’s there now. Should residential or commercial development proposals come forward which match the scale of a four mode transit hub, residents will surely cry foul. I’d like to see some analysis and money for a better link between Danforth GO and Main Subway stations. Even with something as elaborate as a tunnel, it’d still have to cost less than anything in the linked proposals except perhaps for Spadina. Steve: Thanks for alerting us to the availability of the Carlaw/Pape alignment information. 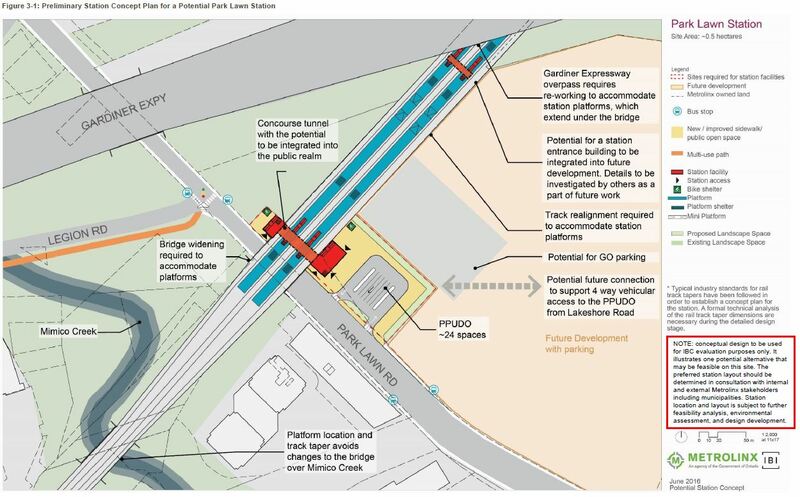 As for Main Station, a connection there, without getting into its cost/attractiveness, deals with a completely different demand and diversion scheme than a DRL. Indeed, I would argue that a SmartTrack station at Gerrard is superfluous, but there should be a DRL station. However, it’s Tory’s pet project, and so there will be a Gerrard station even though it is quite expensive. Full disclosure, I am a West End commuter to York U myself, and yes, I usually take the 41 Keele bus, from Keele Station to campus. Depending on traffic, travel time can take as much as 60 minutes, and the wait time is very unpredictable, especially in the afternoon rush, when I take the 41E to avoid the Steeles/Petrolia detour of the 41B. I usually ride my bike to Keele Station and leave it locked up there. With a Bloor/Lansdowne station on the Barrie line, I would be able to ride my bike there (especially if the rail path bike lane is extended there), and I could time my arrival based on the train schedule. I think it would be safe to say that any combination of GO train travel time + wait at Downsview Park + subway would be significantly faster than the 41 bus, and would not be longer than taking the subway via St.George. On the way home, the wait time at Downsview Park could be longer given the lower frequency of GO compared to TTC subway, but it would still be faster than the bus and more comfortable than transferring at St.George which is very crowded in the afternoon rush. A general comment: the morning commute to York University is very much spread out over the course of the a.m. (staff arrive between 8 and 9, but students and faculty may not arrive until later in the day whenever their earliest class is scheduled); by contrast the afternoon commute is much more concentrated, causing long lines for the 196 bus to Downsview. The morning pattern conflicts with TTC assumptions about rush hour. For example, the last 41 express bus arrives around 9am, and subway commuters between 9 and noon are plagued with delays caused by trains going out of service. Steve: Another point to remember is that by the time there is a ST station at Lansdowne/Bloor, there will also be an Eglinton Crosstown LRT. This will give those living further north an alternate way to reach the Spadina subway. The trip to York via GO Barrie from Lansdowne rather than YUS at St. George saves an average of 9 minutes at off-peak, assuming liberal amounts of time for walking to make the transfers. The worst travel times (15 minute wait for GO) are still almost 2 minutes faster than TTC. Peak hours would save 5+ more minutes on top of that. I agree with Steve’s sentiment, but in this case, if it was my commute, I’d opt to save time. That’s even without accounting for the more comfortable commute on GO. The two caveats are whether we get TTC fares, and just how bad the connection is at Lansdowne. Since these RER/TTC connections actually *can* facilitate shortest routes, it’s even more important that the connecting stations be planned with this in mind, not as an afterthought. GO Lansdowne station should be located a little further north, for better connection to TTC and west to GO Bloor (Kitchener). The diamond grade separation budget be damned. Fixing these bad station designs after RER is implemented will cost a lot more than getting it right the first time. Regarding Park Lawn GO; Metrolinx has really shown their ineptitude and inability to plan rapid transit. 30,000 people will live within 1km or less of that station. First Capital is redeveloping the neighbouring Mr Christie Bakery where they are anticipating more condos, office space, and shopping. That population could easily swell to 45,000 and more with office workers, and those working in the mall. There is land for parking. No parking is a non-starter. The current 66A/B 76, 501, 508 should terminate at this station to feed ridership. None of this is captured in the Metrolinx document, which means they did not do the required due diligence. Mimico is an aberration of a station. Located in a stable neighbourhood with little redevelopment potential (aside from the immediate north of the station). There is no visibility from Royal York and transit does not serve the station. There is also no room for additional parking or transit loops – not to mention the 501 is about 1.5km to the south at that point. This is really why I drive, and no, the streetcar is not rapid transit, or rapid, or barely transit at this point. Be careful now. I’ve looked through the analysis and, in this site operator’s words, it has the appearance of being a rigged result. One thing on the Barrie line’s connections to the Bloor subway and Eglinton LRT. I do agree that, if they get fare integration and site construction right, it will be useful as a north-south line. But I think the more important piece will end up being for commuters looking to fan out to offices closer to Eglinton and Bloor. For Bloor in particular, further-away commuters may consider it a good tradeoff to the extra time the more northern stops incur. That station integration piece is so important, though. I live in the west end. I fly frequently between Toronto and Ottawa. For a while I was taking the UP train from Dundas West in order to use Air Canada for the Toronto-Ottawa route. But, eventually, got fed up with the complex (and poorly-signed) route between the subway and train platforms, and switched all my Toronto-Ottawa (and Toronto-Montreal) travel to Billy Bishop instead. The other major point is travel time reliability. Missing the GO link would add 15 minutes wait time for the next train. At which point, it’s probably faster to walk back to the TTC and transfer at St. George. The 195 Jane or 41 Keele buses are both more frequent if you think St. George is so terrible. 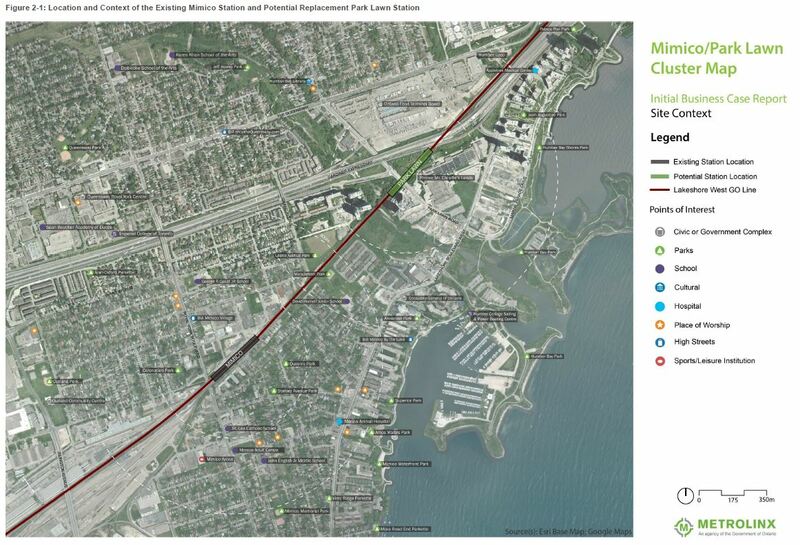 Obviously Metrolinx is not considering or falsely expecting the long term benefits of the potential Park Lawn station. Also, would the current Mimico GO users all be lost? I doubt that as probably at least 1/3 or a half of the population there is already coming from the Park Lawn region. Additionally, there is a capacity to run a ‘Shuttle Bus’ if Metrolinx have not yet thought about the idea. This could well work as of now to the Mimico GO station as well for the potential Park Lawn station. “Potential” development is always very shaky of an assumption. Look at the rosy numbers from the Sheppard Subway. I suspect that there was a bias towards unfavourable assumptions between Mimico and Park Lawn at the very least for the convenience of Mimico for crew changes. Doesn’t your ‘Shuttle Bus’ idea work both ways? If 1/3 or 1/2 of Mimico users are already coming from the Park Lawn area, wouldn’t a shuttle increase that? Steve: I suspect there is a psychological disadvantage in busing people west from Humber Bay to Mimico only to allow them to return east to downtown. Mimico is an aberration of a station. … This is really why I drive, and no, the streetcar is not rapid transit, or rapid, or barely transit at this point. Mimico Station goes back to 1856, and Mimico GO Station back to 1967, so it’s less an aberration and more a stalwart. If keeping open one 150-year-old station is the worst part of transit planning, then I’d suggest you just prefer to drive. I’d like to note that First Gulf has a completely different vision for a Downtown East/Don/Unilever/Queen station than anything in the Metrolinx documents. They have an ambitious plan to have the station spanning the Don river. I always take studies like this with a large grain of salt. It’s in the interest of First Gulf to move half the station off their own useful land onto property that has a mix of ownership from CN/CP, Metrolinx, and the City plus with major concerns/input from TRCA. If you look at their 4th picture, they have the Don Yard lead track running into the side of the building. Developers are very liberal spending from the public purse. I’m going to use Barrie as my example even though I think my comments are generally applicable to any long haul Go rider’s situation on any of the lines. Outside of Smart Track territory, Metrolinx approved another station on the Barrie line up in Vaughan which will be in transportation minister Steven Del Duca’s riding. I took a look at the current schedules for Barrie trains and saw about 1:43 for the first southbound train and about 1:38 for the first northbound train to and from the last stop in Barrie. These are already long amounts of time to be on the train from the end/near the end of the line to Union Station and those times obviously don’t include any travel time between home and the train station at the northern end and Union and people’s places of employment downtown. Adding this station plus the Smart Track related ones are going to seriously increase travel times and I can see why Metrolinx is concerned about ridership drops due to Smart Track as reported in the Toronto Star on March 16th. Between already long travel times from the outer stations on any of the Go lines that would get longer, fare increases around 7% every year for long distance riders, the elimination of the 15% public transportation pass tax credit, the senior levels of government are making a strong case for driving. If the intent is to free up Go train seats to carry Smart Track passengers within 416, there’s a reasonable chance there’s going to be some degree of success to this strategy. If the intent is to keep traffic congestion and vehicle exhaust emissions in check, diluting the cost and convenience benefits of public transportation so they’re close to a wash with respect to driving so people figure the convenience is worth the remaining cost/time difference, this strategy is a total flop. It’s just unfortunate that the costs vs. benefits of repurposing the regional commuter rail system has to be debated because decades of underbuilding the TTC has caused the situation to become so dire that it’s been necessary to put this on the table. Spadina Station is potentially a timesaver (if you’ve been trapped on a train crawling through the USRC, you know what I mean). Bloor/Davenport Station or St. Clair Station are timesavers if you are not downtown. Ignoring that, assuming 6 new stations with a net of 1.8 minutes each, you go from 1:38 to 1:49 and 1:43 to 1:54. It’s a 10% premium on the travel time, but not crippling. It also assumes no other improvements, like having a train every 15 minutes might reduce your wait by a greater amount. Current drive times from Yonge/Front to Allandale Waterfront are from 1:30 to 2:50. Beyond the variability in the time, many people enjoy doing other things than driving for those four hours a day. Barrie is a long way from downtown Toronto and I wonder how much sense it makes to spend money providing quick service for commuters to downtown Toronto from that far away. I get that people are driving via the 400 every day, but that also strikes me as questionable. Allowing — or forcing — people to live 80km away from their work locations is a problem that is really only being papered over by GO service to Barrie, Guelph, Hamilton, and maybe in the future St. Catharines, Brantford, or Peterborough. I don’t know what the answer is (and neither do the politicians or planning experts, apparently) but the GO rail and bus system expansion is now starting to resemble the Toronto subway system model, with ever longer branches, and an inevitably longer and more crowded ride. Ed said: Barrie is a long way from downtown Toronto and I wonder how much sense it makes to spend money providing quick service for commuters to downtown Toronto from that far away. I would say commutes are dictated by housing prices. Ideally, we could all have detachted homes within walking distance to our places of works. Practically, that’s not possible, so people are forced into a dichotomy of choices: house in Barrie or condo in Markham. GO has been servicing this choice for 50+ years, but it’s a much more involved process/answer to shift our planning policies to form the type of communities we need. Metrolinx is just focused on transit, so they build the best transit system for our current society. We need an umbrella organisation that gives consistent direction to all of our public agencies. As long as we are permitting sprawl, stations in Vaughan, Newmarket, and Innisfil reduce its ill effects. I was told by a Metrolinx rep recently that they are in process for getting the entrance under the Crossways done. Steve: I am glad to hear this, but it is long, long overdue. Also this link fundamentally changes the plans, such as they are, for a “mobility hub” at Dundas West / Bloor. Mapleson, there’s a huge excluded middle between “detached house across the street from your place of employment” and “commute daily from Barrie to downtown Toronto for work”. It’s pretty obvious that “all the jobs for everyone in the GTA must be in Toronto’s central core” is neither desirable nor possible nor even currently the case. My criticism of the GO system, rail in particular, is that’s the way it’s laid out. Spokes extending as far as Kitchener and Barrie all run to a single point, Union Station. As long as this is the model for transit, the spokes will reach ever further out, the trips will be ever longer, and Union Station will become ever more inadequate. I think the argument for Barrie service is that it’s cheaper than adding a lane sooner to the 400, and then maintaining it. Not that it won’t happen eventually. The improvement on spoke lines is to have them intersect with urban services, turning it into a web. This requires efficient, accessible, comfortable connections, which Metrolinx seems to consider only occasionally. The other thing you do can is run “Zone Express” in the peak periods. Instead of running all trains local to the end of the line you run a mix of express and locals. For example on a line with 15 stations you might run a train station 15 to 10 local then express to the inner end. A couple of minutes after the outer train leaves station 10 a local to station 5 leaves. After it leaves a local runs from 5 to the inner end. This does trade frequency for speed but it also helps to insure that there are seats for people on the inner end and saves running all the trains to the end of the line which should reduce equipment requirements. Depending on the frequency it might be possible to do this without the need for a third track immediately.